U.S. stocks closed lower Friday, weighed by renewed global growth concerns as benchmark yields fell to record lows and investors looked ahead to U.K. vote on whether to leave the European Union. I think some of this today is "Brexit," some of it is global growth concerns, some of it's the Fed,"
Bull market (Dark Green over red). Nothing but strength. Notice the turn around pattern in the second window showing gaining momentum in the 50 day slope. The 4 day (light green line) turning down. Bull Market = Bullish outcomes. Lots of jobs! But this is a lagging indicator. Personal consumption represents 70% of U.S. GDP, therefore a financially healthy and employed consumer plays an outsized role in swaying economic trends. The newest data was a small disappointment and it shows as the lines have slightly converged, this is not time to panic yet. Not good. Watch this carefully, all recessions have falling industrial production, but this data is from the end of April. Notice a clear round top in the 12 period moving average. This is the sign of a recession looming. Three white bricks, the trend is up. CAUTION: Notice that Friday was a sharp sell off. OBV lags the market. 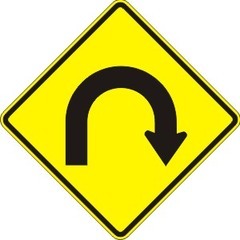 Pros are not buying this could be a sucker run up – Caution could signal a pull back from this run up. VIX is the fear gauge ... last week 13.58 now 16.16 The experts are buying insurance. Could be the start of an uptrend. Don’t panic yet. Last week 69% this week now 62.8% of stocks are above their 50day MA. Now gaining loosing momentum. Looks possible ready to roll over..
TRIX is green over red, but it is narrowing. Expect positive outcomes. ..
Nasdaq is weakening, this is the first red in the second window in 4 weeks. Still aggressive but late in the game, expect a defensive move now. Consumer slowly fades (concerning). Bonds explode up. Experts are buying bonds to avoid a equity pull back? 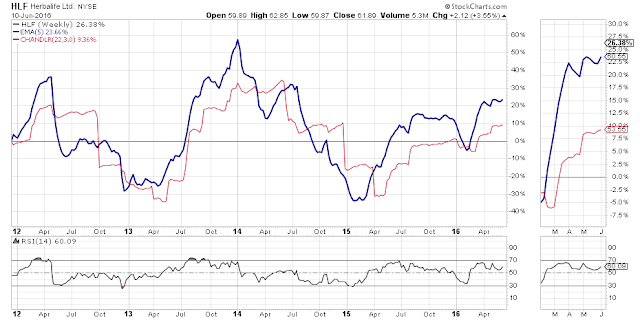 Short-term bonds are strong -- long term up trend is up. The pros are getting very defensive. Notice the defensives/utilities are rising fast, consumer is at bottom of normal range, financials are dropping and tech is sliding a bit. Some recent signs of life in commodities and gold. 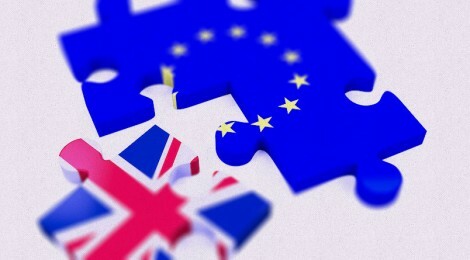 A referendum is being held on Thursday, 23 June to decide whether Britain should leave or remain in the European Union. The race is close with the current poles running with in 1% of each other. Surging numbers of applications for British citizenship have been submitted by European Union nationals alarmed that a Brexit vote could jeopardise their status in the UK, it has emerged. Red Squirrel, a publisher of textbooks preparing candidates for citizenship tests said sales had quadrupled since it became clear that David Cameron would hold his promised EU membership referendum in June. The Economist has excellent coverage of the whole issue. London is flooded with east block migrants from Poland and the Czech republic and it is creating social unrest. The issue is not only Globalization, and whether it is always a good idea. Particularly the issues of the right of citizens to travel across boarders for work. 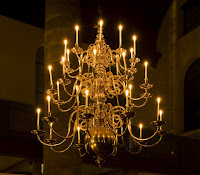 The Chandelier Exit was developed by Charles Le Beau and it was introduced in Alexander Elder's books as a stop-loss strategy (trailing stop) that is based on the volatility measured by the Average True Range (ATR) indicator. Including volatility component in a stop-loss strategy is one of the one of the way the volatility is used in technical analysis. It is logical to have bigger trailing stop (stop-loss) during higher volatility trading as it helps to avoid choppy trading. At the same time, a smaller trailing stop (stop-loss) during lower volatility trading allows to close position closer to the top by getting maximum gain. The idea is if you are trading a stock that exploded up and down like a technology stock you need more room for your stop than say an index of big banks that move slowly. Below are two charts, notice how much simpler it is to judge the stops on the Dividend paying stock ETF than it is to track a controversial volatile stock like Herbalife. The red line is 3X Chandelier stop. 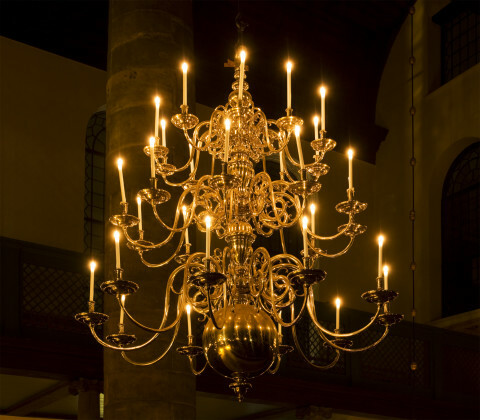 The Chandelier Exit is a wonderful tool to tell you when to sell a steady investment but the down side is most brokers do not offer a Chandelier stop in their trading platform so you must manual move the stop on a regular basis to keep it relevant. Fridays reaction to the Fed statements caused a bit of a sell off, except for a small bounce off the bottom going in to the close. However any one day reaction is NOT a trend, so we need to see what Monday brings. 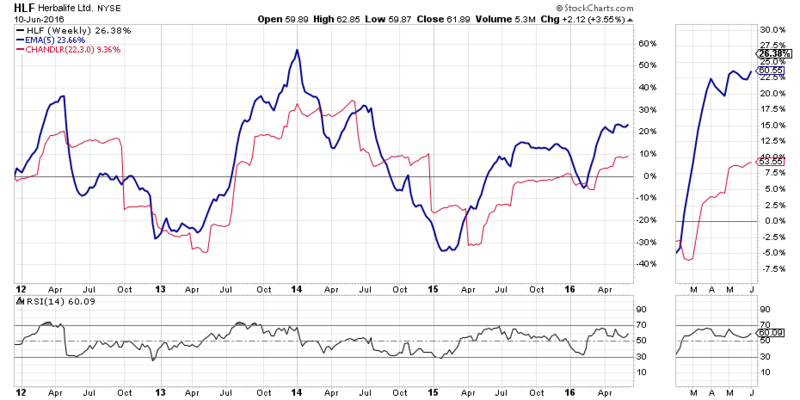 We are still green over red on the Bull Bears (bull market) and we have a very strong market breadth in NYSE new high low chart, so don't panic yet. That said, on Thursday the market was way over bought and the VIX was near the bottom of its range so as I said last week a pull back would be appropriate here. If you really want to stay up at night worrying, you might consider that we are getting some very poor numbers in consumer discretionary and in short term employment numbers. Couple that with a down trend in manufacturing and I would say this is a time to raise your stops and play it with caution. 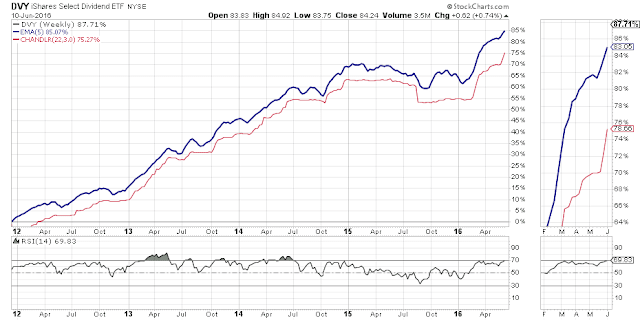 My primary long holding right now is DVY the dividend ETF, and I have a stop above my cost to lock in profit if we sell off here. Still long but very conservative.